Home | Marin on Ice Returns to Northgate this Holiday Season! Marin on Ice, Marin County's only holiday ice skating rink, returns to Northgate in San Rafael for a fourth season of open-air skating, opening Wednesday, November 8, 2017 and running through January 7, 2018. The rink will be open daily, including holidays. Opening times vary, but the rink is generally open from 2 to 9 pm during the week and 11 am to 10 pm on weekends, with extended weekday hours during Winter Break (December 25–January 5). Check Marin on Ice's calendar for exact hours. Special events at Marin on Ice for 2017 include Disco Night on November 15, '90s Night on November 29, Ladies' Night on December 6, Black Light Night on December 13, and Couples Night on December 20. The Marin on Ice rink will be located in the same spot as in previous years, in Northgate's Oaktree Plaza near Kohl's and offers 6,400 square feet of real ice. Skating costs $15 per person, which includes skate rental, and "Skate Buddies" (the blue plastic chair-like supports) are available for beginners of all ages. Skates are available in sizes from a child's 9 to an adult 13. Tickets are good all day and include in and out privileges. Frequent skaters can purchase books of 10 tickets for $120—a 20% discount. Active military, police, and fire department personnel with ID receive $13 discounted admission. Those lucky enough to have a birthday in November, December, or January can have a skate party at Marin on Ice! Birthday parties are offered during public skating hours, and the cost starts at $275 for up to 12 skaters. Two-hour parties include a private tent area, skate rental for everyone, a table and chairs, and more. Outside food and beverages are allowed (excluding alcohol). The rink's four tent sections can be combined so parties can be for 12, 24, 36, or even 50 skaters. Non-skaters can join the party free of charge. Private rink rentals are also available for your group, organization, or business on select days and times. To book a party or private event call (707) 253-1324 or fill out their online reservation request form. For more information on Marin on Ice, visit www.onicerinks.com/marin-on-ice. Northgate Mall is located off Highway 101 in San Rafael's Terra Linda area, between Northgate Drive and Las Gallinas Avenue. Plenty of free parking is available in the parking structure adjacent to the rink. Restroom facilities and plenty of restaurants can be found in the mall. 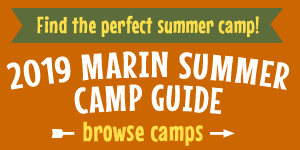 Disclosure: Marin on Ice is a Marin Mommies promotional partner.